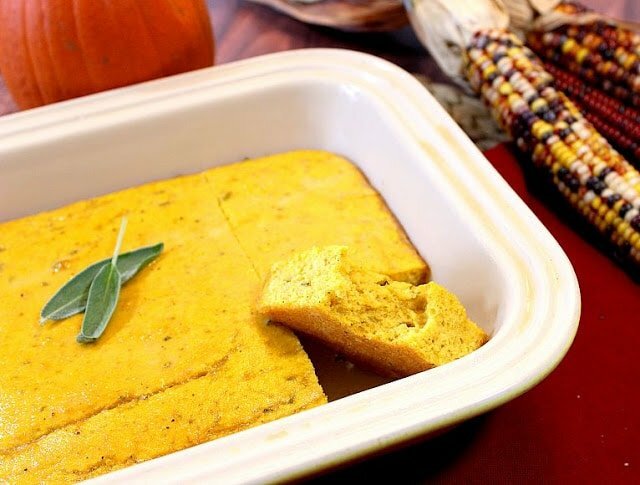 A hint of pumpkin and a touch of sage makes this Buttery Pumpkin Sage Cornbread a wonderful side dish for any autumn meal. Now that the weather is turning cooler and the days are getting shorter, I figure it’s finally time that I dip my toes into the pumpkin pool. 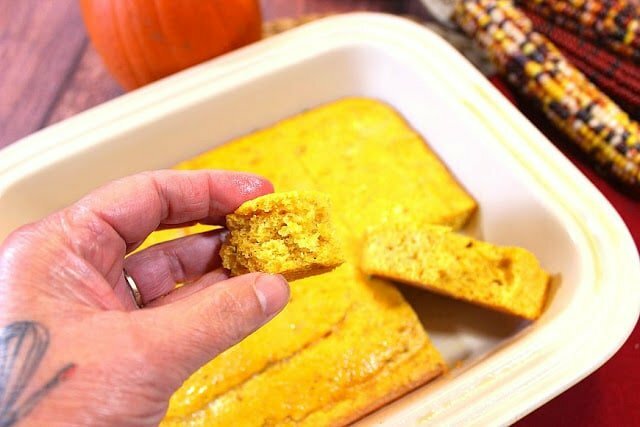 I held off as long as I could, but the idea of the Buttery Pumpkin Sage Cornbread kept calling my name. When it comes to cornbread, I’m not traditional, and I’m not Southern. 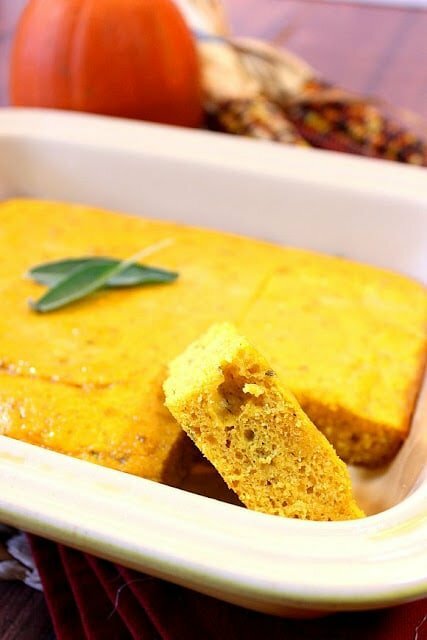 Therefore, I like to play with my ingredients list from time to time, which led me to this particular rendition for an autumn inspired cornbread. I tend to like my cornbread a little on the sweet side, so I always like to add a touch of sugar to the mix. I also like my cornbread a little on the moist side, so it doesn’t crumble and fall into my lap before making it into my mouth. I’m crazy like that. 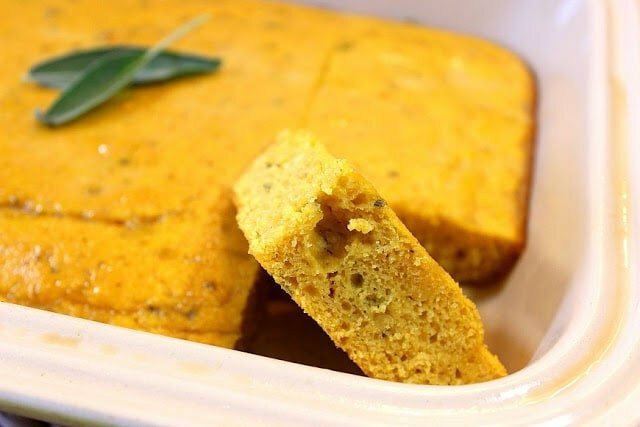 This particular recipe makes a softer, cake-like cornbread that has a touch of sweetness from the brown sugar and a slight aroma and taste of fresh sage that pairs nicely with the savory autumn pumpkin. -In a large bowl, whisk together the flour, cornmeal, salt, pepper, baking powder and brown sugar. 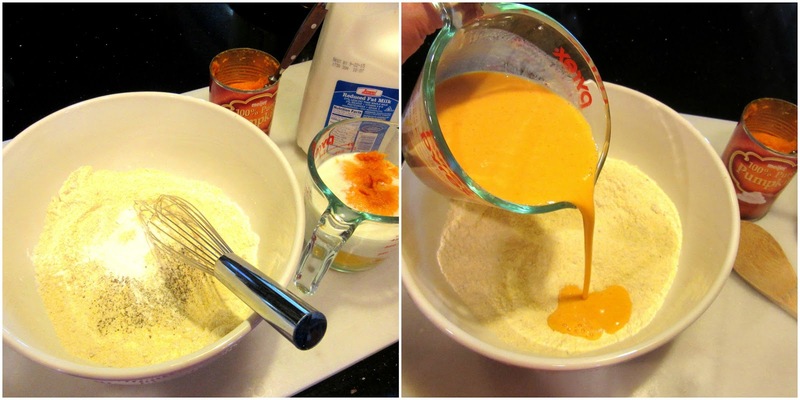 -In a medium bowl, whisk together the milk, vinegar, egg and pumpkin. Pour the pumpkin mixture into the flour/cornmeal mixture and mix with a wooden spoon to completely combine. Stir in the chopped sage. 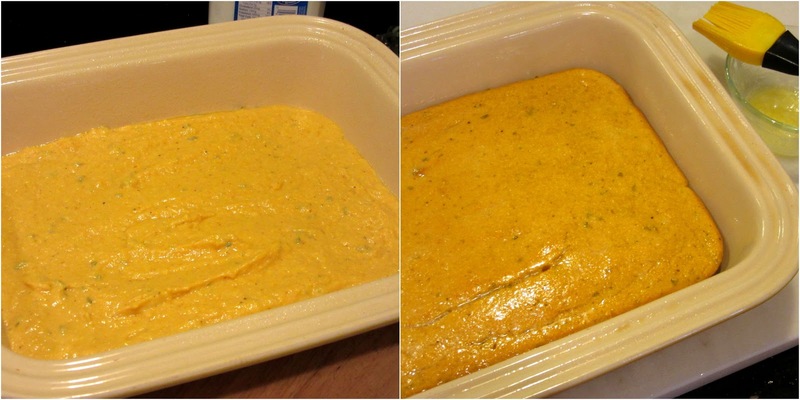 -Spoon the cornbread mixture into a casserole dish that has been sprayed with baking spray. Spread the mixture evenly in the dish and bake in a preheated oven for 45-50 minutes or until a toothpick inserted in the center comes out clean. -Remove from oven and immediately brush the entire surface with the melted butter. -Serving warm is best, but it’s also tasty at room temperature. 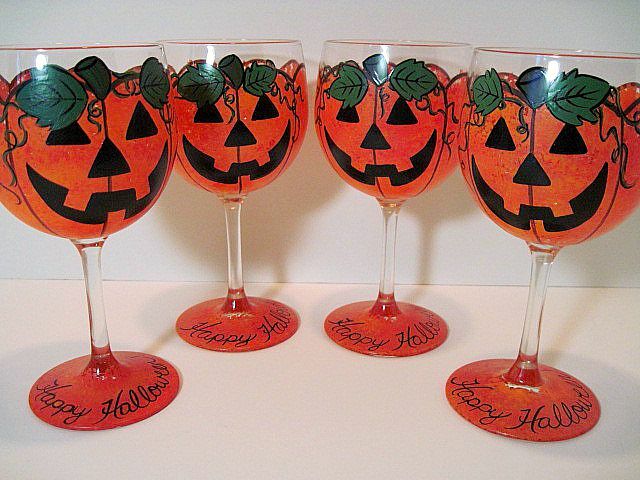 Naturally I needed something pumpkin themed to go along with this pumpkin sage cornbread, so what about this set of 4 Jack-O-Lantern wine glasses? Four cheers for pumpkin season! Are you with me? If there is ever anything I can paint for you, from glassware, to aprons to tea towels, please don’t hesitate to contact me or visit my shop on Etsy. Custom orders are always welcome and always appreciated. Together we give the gifts that people remember! First off, those glasses are adorable!! I bet your house smells amazing when the bread is cooking! YUM! 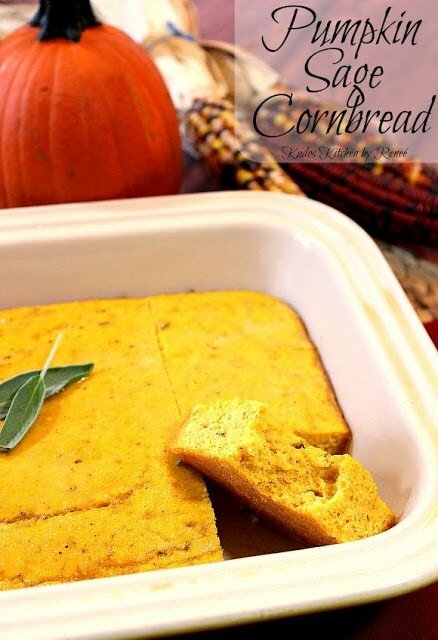 I used butternut in cornbread last fall aznd it was really delicious. Pumpkin is a great idea! I absolutely love this! On my list to make and I know it will still work with my vegan subs for the milk and egg. Thanks so much for this festive and moist looking cornbread. I don't care if it's traditional! It has pumpkin and it's corn bread! I Wants it ! I love this recipes, the flavour profile is amazing. Cornbread is something I need to make more often. I really need to get in touch with for some aprons. Once my eye heals up I'll shoot you an email. Oh! loving this on a few levels! Sage!! Pumpkin!! Both in a cornbread??? Never came across that before, love it! Living in the South and being served traditional cornbread wherever we go… I can most definitely use a change of pace! I love that you added pumpkin and sage. Wonderful combination! !